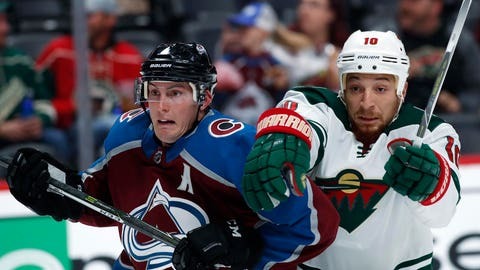 The Minnesota Wild got out to a 1-0 lead after one period, but the Colorado Avalanche responded with five unanswered goals of their own to hand Minnesota its first loss of the preseason, 5-1. Newcomer Marcus Foligno scored the lone Wild goal with a tip-in up front on the power play with under one minute to go in the first period. Colorado scored two goals in the second period and three more in the third. Minnesota had won its first three games of the preseason: 3-2 and 1-0 over the Winnipeg Jets and 2-1 over the Avs on Saturday. The Wild have three games remaining in the preseason before the puck drops on the regular season Oct. 5.